This past Friday, I was in an arena filled with flashing lights, loud music, and hundreds of cheering fans. I wasn’t at a rock concert, or a NCAA basketball game. I was at a robotics competition, specifically the FIRST Sacramento Regional hosted at the University of California, Davis. 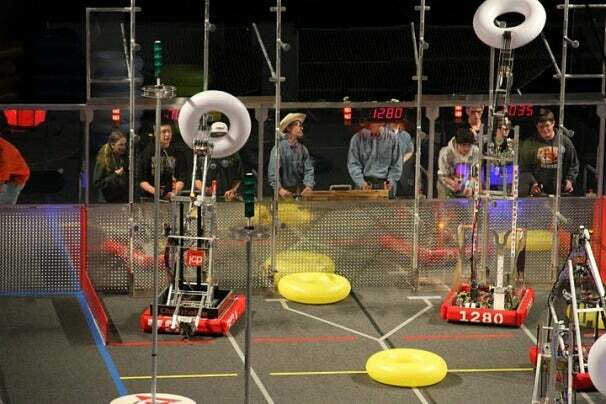 It’s one of many regional competitions hosted by FIRST (For Inspiration and Recognition of Science and Technology) as a part of the FIRST Robotics Competition. Here’s how the competition works. Early on a Saturday morning in January, teams of high school students from all across the country watch a Webcast from Manchester, New Hampshire to find out what game they’ll have to design, build and program a robot for. After that Webcast, they have six weeks to work long hours to come up with a robot that will be able to do well in the competition. After the last day of build season, the teams get a couple weeks off, followed by six weeks of regional competition that takes place all across the globe. The regionals are free events, and open to the public, which gives you a chance to go see the fruits of the students’ labors, and watch them compete. (Did I mention they’re free?) It’s an awesome way to spend a Friday or Saturday. Of course, just showing up at a regional is possible, but it’ll help to have a working understanding of the game. Here’s the basic gist of the game: There are two alliances, colored red and blue, made up of three robots each. They’re controlled by humans on opposite sides of a 27 by 54 foot playing field. Each match lasts for two minutes and fifteen seconds, and is broken up into three periods: the opening 15-second autonomous period, and then drivers gain control of their robots for a 100-second main period, followed by a 20-second endgame. The goal of the game is to earn more points than the other alliance to win the match. There are two major ways to earn points: hanging inflatable shapes on the racks on either side of the field (each alliance has their own) or deploying a “Minibot” during the endgame to race up one of the four poles around the field’s center line. Teams can also score additional points by hanging a special “über-tube” on their scoring rack during autonomous mode. If you’re interested in even more gory detail, check out the animation above. I spent my entire Friday at the regional, and didn’t regret a minute of it. It’s a great environment, and totally worth the time to make it there. If you only have a single day to spend at the competition, see if you can make it on Saturday. They hold elimination rounds in the afternoon to determine which alliance will win the regional and have a chance to move on to the championships. As of the time of posting, there are still three weekends full of regional competition left. You can take a look at the full schedule to see if there’s a regional near you. If you happen to live in the St. Louis area, the FIRST Championship will be taking place at the Edward Jones Dome from April 27-30. Blair Hanley Frank is wondering if Minibots dream of electric lambs.